Los Candados mine. Photo from Germán Dam's Twitter. Following the 2016 "Tumeremo Massacre" where 17 miners were killed and another violent episode last August that left 13 people dead, a new massive killing took place this week in Venezuela's so-called Mining Arc. 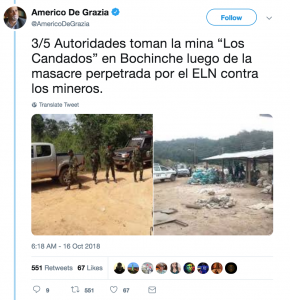 According to information made public by opposition MP Américo De Grazia, 16 people died and six were injured after two criminal bands clashed in their quest for controlling the Los Candados gold mine. 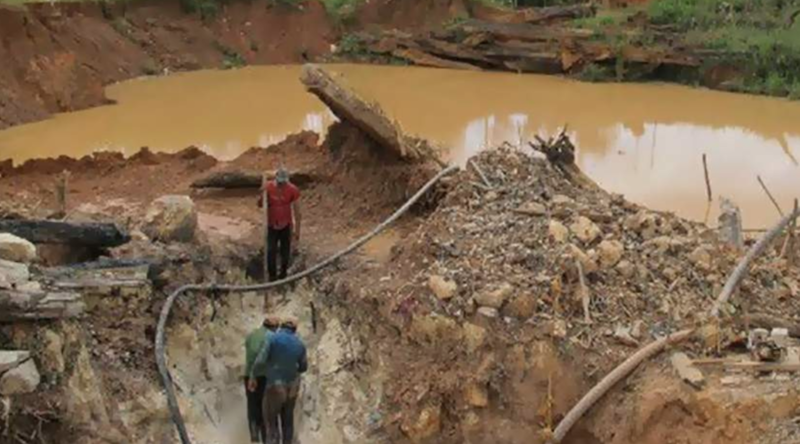 The mine, where seven bodies have already been found, is located near the town of Tumeremo, in the southeastern Bolívar state. Villagers interviewed by local media have confirmed De Grazia's hypothesis. They also said that even though there is police and military presence now, they cannot leave their homes after certain hours because El Coporo's band is threatening everyone who dares to go outside while the search for the bodies of those who died on October 14 is ongoing. Businesses and schools remain closed. Despite people's complaints and their demands for safety, regional and central authorities have not made any public announcements related to the massacre. This is the same approach they took after what happened in 2016. However, there is a joint commission composed by members of the army, National Guard, military police, and regional police investigating the case. In response to the silence from the Nicolas Maduro government, families of the victims gathered in front of Fort Tarabay asking authorities for answers. Another group of people gathered in the La Teja sector, where a commission investigating the case is working. The Mining Arc of the Orinoco River National Development Strategic Zone is a 111,843 Sq.Km concession area for mining gold, diamond, iron ore, copper, bauxite, coltan, among other resources. The creation of the Arc has been controversial since it was announced in 2016.